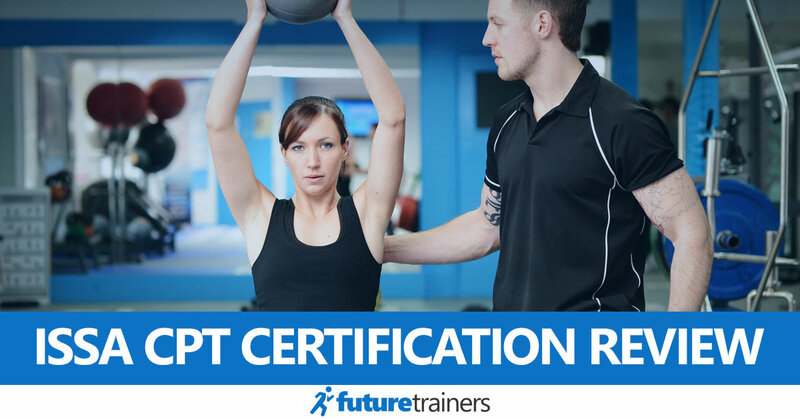 ISSA Personal Training Certification Review  – Is This CPT Program Worth The Price? The International Sports Sciences Association (ISSA) is a respected organization that provides certifications for fitness professionals. This includes their popular ISSA-CPT program for aspiring personal trainers. In this ISSA certification review, I’ll take a closer look at the program. How comprehensive is the learning material? Is the certification widely accepted by gyms? And how does it compare to other certifying organizations? Let’s find out. How Long Does It Take to Pass ISSA? The ISSA personal trainer certification is a flexible and home-based program. It’s more of a “general” program than a specialized certification, so it’s great for working with a wide range of clients. The program aims to teach the practical skills required to be a successful personal trainer via online training materials. This includes foundational knowledge in sports medicine, program design, client assessment and nutrition. Unlike most other certifications, the exam is open-book and can be completed at home. This makes it an attractive choice for people who can’t visit test centers. It also has a higher pass rate than other certifications (more on that in a moment). Like most certifications, you need be at least 18 years old and have a high school diploma (or equivalent). You must also have a current Adult CPR/AED/First Aid certificate. Interestingly, ISSA is one of the few certs that accepts online certificates for this – and they now offer their own if you’re not sure which to choose. The International Sports Sciences Association was established over 30 years ago. It’s certainly not one of those shady “online certs” that’s popped up over the last few years, and it has a strong reputation in the fitness industry. This wide range of certifications is great if you want to focus on a specific type of client after betting certified. They also count towards your CEUs (see the section below). As you can tell from the list above, ISSA is more focused on healthy clients than clinical fitness. If you’re looking for a certification with a slight gearing towards clinical situations, look at ACSM instead. ISSA also offers Elite and Master trainer certifications. These expand on the foundations provided by the basic CPT program, and can be a great way to take your training to the next level. As you would expect, the entry requirements for these programs are stricter than the basic CPT course. You need to have completed both the standard CPT and fitness nutrition certifications, plus a selection of the other programs (one other program for the Elite Trainer course and four others for Master Trainer). They are also expensive - $1797 for the Elite Trainer and $3594 for the Master Trainer. For these reasons, you probably won’t be thinking about taking the Elite or Master program until you have more experience. It’s great to know the option is there as you progress in your career though. The most common and widely-recognized accreditation in the PT world is NCCA. Programs that are accredited by the NCCA have passed the organization’s strict standards, which is why these certifications are often widely accepted by gyms and studios. Unfortunately, ISSA is not accredited by the NCCA. In fact, it’s the only organization that made our list of the best CPT programs that isn’t (the full list is on this page). The ISSA certification programs are nationally accredited by the DEAC though. This is a federally-recognized agency that certifies educational programs, so it’s almost as prestigious as NCCA. Unlike the NCCA, however, the DEAC doesn’t provide accreditation for certification exams, but instead for programs. The difference is subtle, but is one of the reasons why ISSA probably isn’t as widely accepted as NASM or ACE – although it’s still a legitimate certification in the eyes of many gyms. What does this mean for you and your career though? ISSA is an excellent certification, but it’s important to check your potential future employers accept it. If they don’t, it could be hard to get a job without a different certification. This goes for all certifications – NCCA-accredited or not – as each gym has its own preferences when hiring. Fortunately, many gyms recognize ISSA as a certification program. ISSA has even partnered with gyms such as Urban Active Fitness, Powerhouse Gym, 24 Hour Fitness and others. These gyms regularly post jobs for ISSA graduates. Note: As the name suggests, the International Sports Sciences Association certifies trainers around the world. Outside of the US and Canada, it is accredited by the European Register of Exercise Professionals and the International Health, Racquet and Sportsclub Association. With the thorny issue of accreditation out of the way, let’s take a closer look at the cert itself. Personal training certifications are notorious for offering a confusing array of learning materials, deals and packages. This can make it hard to know which materials you really need and which you could do without. An advantage of ISSA is that there is only one option when buying the CPT program. This costs $599 and includes all learning materials, access to an online student forum, unlimited support and even a free professional website. You also get an exam token along with one free retake (should you need it). The downside of this one-package payment system is that you can’t customize it to your requirements. If you already have access to the materials, for example, then there doesn’t seem to be an option to take the exam only. ISSA estimates that most students need 8-10 weeks to prepare for the exam. This assumes you can study for at least an hour each day. If you have prior experience or can dedicate more time to studying, you may be able to pass faster. As the exam is online, you aren’t limited by pre-determined testing dates. It’s important to feel confident that you know the syllabus before taking the exam though. Something else to note is that your course must be completed within 4-months of purchasing it. Make sure you give yourself plenty of time to study, as you’ll need to pay a fee if you don’t take the test before this limit. A range of physical and digital study materials are included with the ISSA CPT program. These include the main course textbook, study guide, workbook and an online exercise lab. The most important content is contained in “Fitness – The Complete Guide.” This is a 759-page textbook with everything you need to know to pass the ISSA personal trainer exam. It’s a hefty book, but is relatively easy to read. The book is provided in both physical and digital formats. Aside from the textbook, the online exercise lab is a useful addition to the program. It contains 3D animations of 250 exercises, helping you learn the correct technique and form. While the textbook contains excellent information, I feel the other materials are limited compared to competing certifications. You don’t get a cueing library or lecture videos, for example, like you do with NASM. The included materials are of a high-quality though, and provide everything you need to pass. What can you expect to learn in the textbook and other materials though? Program Development – ISSA teaches how to design programs for a wide range of clients. This is essential for getting results, as the best program for an athletic person is different to someone who has never been to the gym. Topics covered include basic assessment, training principles, periodization and training loads. Anatomy and Physiology – It’s vital for personal trainers to understand anatomy and physiology. The course textbook covers topics such as metabolism, the musculoskeletal system and physiology. Physical Fitness and Health – A personal training certificate is not a license to practice medicine or a clinical degree. It’s still important, however, to understand how a person’s health affects their ability to exercise. Nutrition – ISSA offers a separate certification for fitness nutrition, but the CPT program covers the basics. Kinesiology and Biomechanics – ISSA students are taught a foundational knowledge of how the body moves. You’ll also learn musculoskeletal deviations and the mechanics of strength. The 3D exercise animations teach you to apply this information to real-world situations. Fitness for All. Once you have a solid understanding of the other topics, the textbook teaches how to design fitness programs for a diverse range of clients. These include older adults and young people. There are also sections and case studies on designing programs for people with diabetes, hypertension, arthritis and asthma. All the course materials are available online, so you can start studying immediately after purchasing. ISSA also ships you hard copies of the textbook and study guide. An advantage ISSA has over purely self-study programs is the support provided. Unlimited educational support is included in the price, and this continues even after you’ve passed the exam. You also get access to an online forum, where you can ask other trainers and ISSA staff questions about the course material or other professional challenges. I also like that ISSA has included a marketing and business guide. If you plan to develop an independent client list once you are certified, this shows you how to get your first customers. Note: If you’re feeling overwhelmed, ISSA offers a guided study program. This organizes weekly tasks into a 10-week program, including reviews of important concepts and dividing the course into manageable steps. It costs $299 and could be worth considering if you want to pass as quickly as possible. One of the biggest advantages of taking the ISSA personal training certification is that the exam can be taken online. If you live outside the US – especially if your country doesn’t have testing centers for other certifications – this is one of the best ways to get certified. It’s also more convenient if you don’t live in a major city. What does the exam involve though? The final test is open-book and taken entirely online through the member's portal, so you can use your study materials. This arguably makes the test “easier” – although this isn’t necessarily a good thing. When you’re training a client, you won’t be able to get out your textbooks, after all. So, you need to make sure you really learn the material. Aside from being online, ISSA does things a bit differently to other certifying bodies. Instead of testing with only multiple-choice questions, there are also short essay questions to test your knowledge and communication skills. While these questions make the exam harder, they are important for maintaining the legitimacy of the ISSA exam (especially as it’s online and open book). You need to understand the concepts more rather than just memorising answers. To pass, you must achieve a score of at least 75% on all sections. Don’t panic if you fail though, as the standard ISSA program includes a free retake. If you need additional retakes, the cost is $50. Compared to many certifications that charge up to $200 for a retake, this can potentially save you a lot of money. ISSA requires you to recertify every two years. This costs $99 and you must show a valid CPR/AED/First Aid certificate. In addition to the renewal fee, you’ll also need to complete 20 CEUs each year. One CEU credit equals a single hour of instruction, and the units must either be taken through ISSA or one of their approved providers. While $99 every two years isn’t a huge amount of money, it’s higher than certifications such as NSCA or ACSM. These certifications require many more hours of CEUs though, so ISSA can work out cheaper in the long run. When it comes to 2-year recertifications that require 20-hours of CEUs, ISSA is priced around average. Note: The renewal fee is waived if you complete all 20 CEUs from ISSA-specific CEUs or certificates. 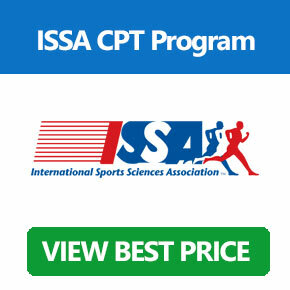 The pricing structure of ISSA is probably the simplest of any personal training certification. $599 gets you access to everything, including the training materials, exam and a retake (if required). The price of $599 is relatively cheap for such a well-rounded program. NASM’s cheapest program, for example, costs $699 and doesn’t include any educational support from mentors or a retake. ACE’s cheapest program is also $699. This makes ISSA a great option if you want a convenient and all-inclusive program for a reasonable price. The organization also offers deals, coupon codes and discounts regularly – especially during holiday seasons. With that said, the ISSA personal trainer certification might not be the best choice if you already have access to study materials. ACSM, for example, offers an “Exam Only” option for $349, which is a lot cheaper if you don’t need the textbooks and other learning materials. Note: ISSA offers an interest-free payment plan. If you can’t afford the $599 in one chunk, this could be an option to consider. ISSA doesn’t currently offer insurance to personal trainers. They do endorse certain providers of liability insurance though, so the support team can point you in the right direction. As ISSA isn’t certified by NCCA, it probably isn’t as widely recognized as programs such as those provided by NASM or ACE. It’s still accepted by many gyms though, so it provides strong employment prospects. It’s vital to make sure ISSA is accepted at the gyms (or other businesses) you want to work at though. You don’t want to wait until you’ve paid for certification before you find out. This goes for any certification – including those that are NCCA approved. The ISSA personal training certification is an excellent program – especially if you prefer to take the exam online. While the open-book test is easier in some regards, the inclusion of short essay questions balances this out. ISSA also offers plenty of scope for future specialization, including their Master and Elite programs. Another advantage is the price. At $599 for all materials, exam and a retake, it provides great value. The organization also provides a well-rounded textbook, useful training materials and great support. I especially like the extra material on marketing and running a PT business, as this is often overlooked by certifications. It’s important to be aware of the downsides of the program though. The lack of NCCA-accreditation is a big one, as it means ISSA isn’t as widely accepted by gyms and studios. If you know which gym you want to work at, make sure you check they accept ISSA before you pay for the program. The training materials are also not as varied as other programs. While the textbook provides everything you need to know, if you prefer to learn via video you’ll need to pay extra to get the guided study program.